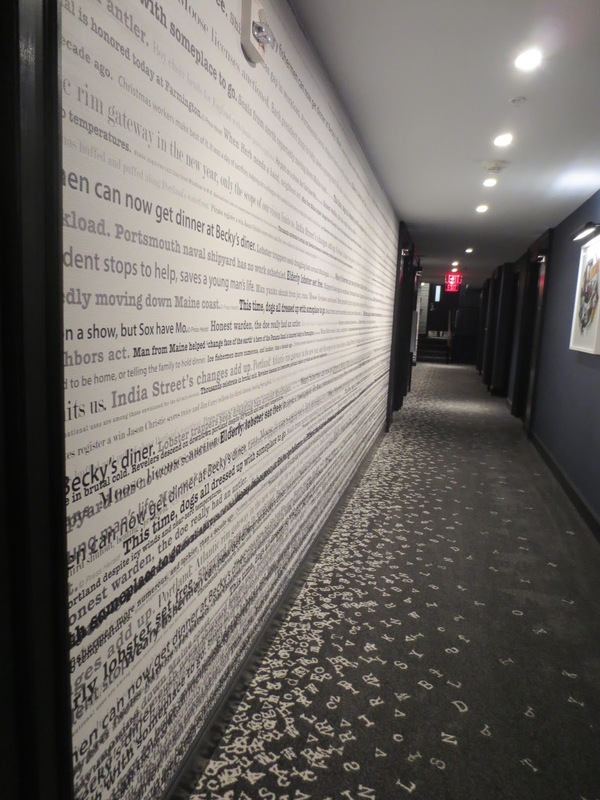 I love the concept of a "Press Hotel," the story behind it, and the tagline "More than Words." I would love to stay in that hotel. It's great that you had an important role to play in this art installation, so fitting. 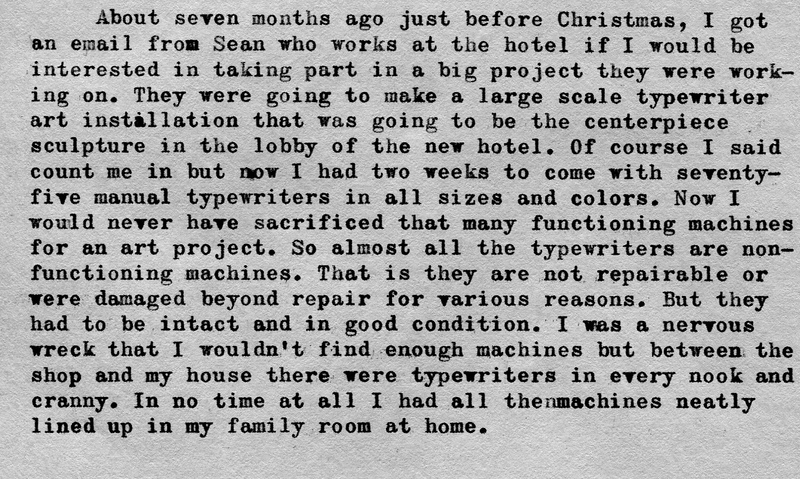 I could only imagine the challenge of gathering 75 non-repairable typewriters! Thanks for this amazing post, Tom! How cool! I've seen pictures of the installation on Instagram (people love to share their encounter with the typewriters) but didn't know that you had anything to do with it. The hotel sounds great. What a great use for non-repairable typewriters. They sure look beautiful on the wall. Looks great. It reminded me of the similarly themed "Local Edition" cocktail bar, located in the basement of the Hearst Building in San Francisco. Personally, I'm really pleased they sought you out to source the machines rather than just buying up random machines in the wild. Having a professional pick from "cosmetically good but probably never work again" stock is really an enlightened and respectful way of using the physical machines themselves in an art installation. Very glad they got you and didn't mount usable machines! That whole place looks awesome. Very dramatic display. 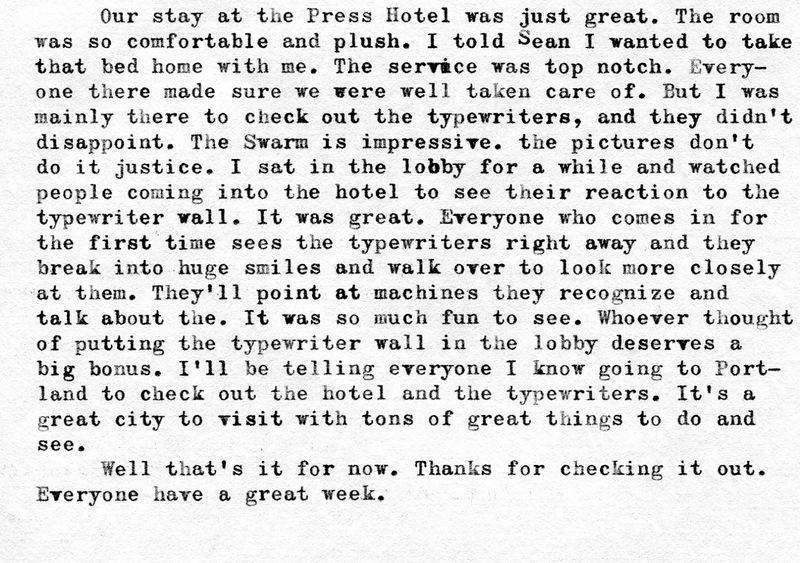 I'm glad that you were able to be the sole provider of the typewriters. Ton- Thanks for the awesome comments. 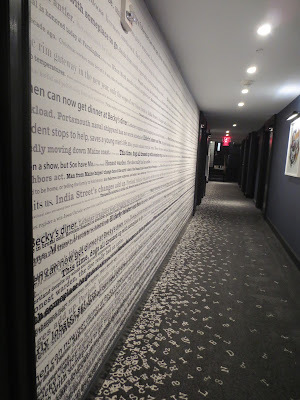 It's very cool how the hotel has used the typewriter theme throughout the building. Richard- I agree! 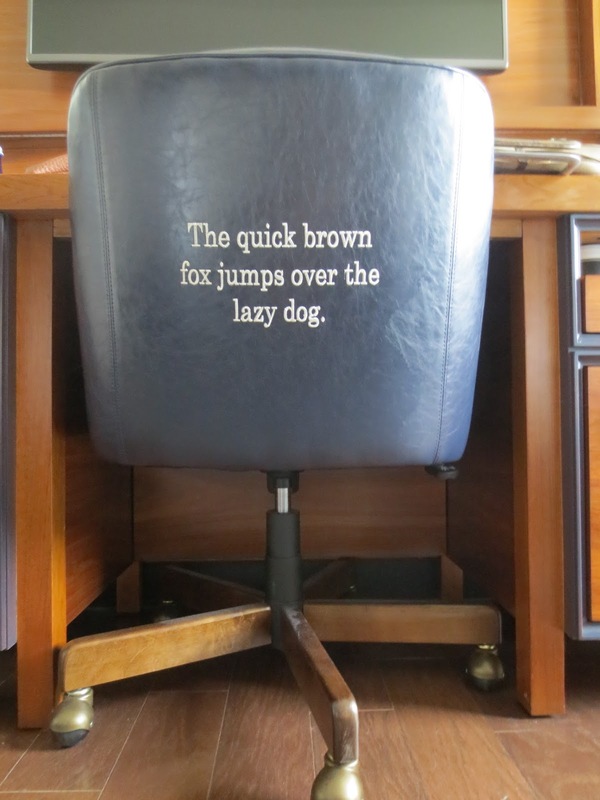 I love how people show their typewriter encounters on social media. Thanks! Thanks everyone for your generous comments. I was so happy to be a small part of this art project. It sure did free up a lot of space in the shop although you wouldn't know by looking at it now. The place is really packed. Thank you Tom! It was a pleasure to work with you. 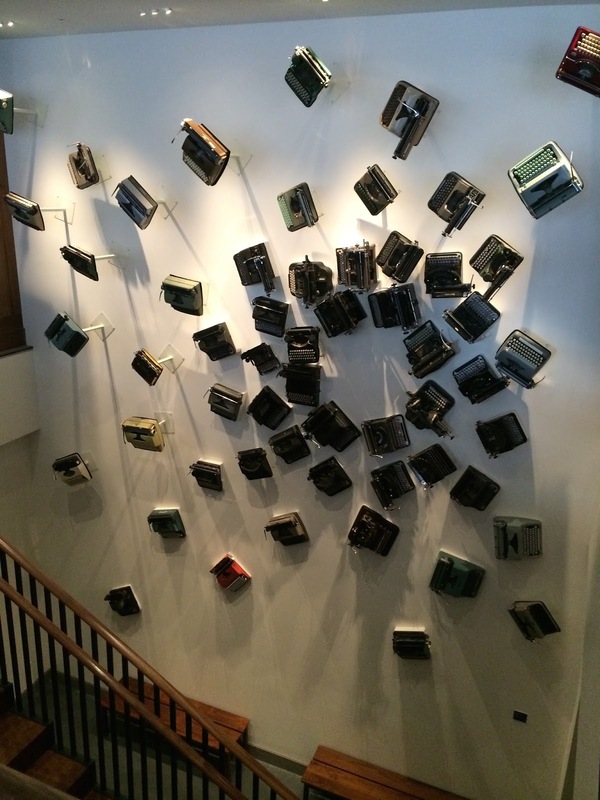 I'm thrilled with how the piece came together and the positive response to the "SWARM" installation. Erin- Thanks a million. It was a pleasure to work with you too. 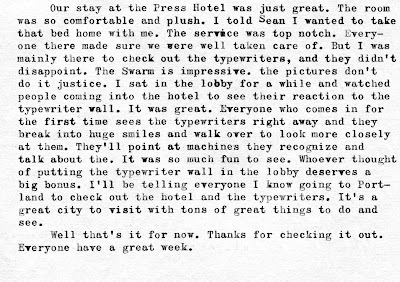 The typewriters were beautiful. It was more that I expected. 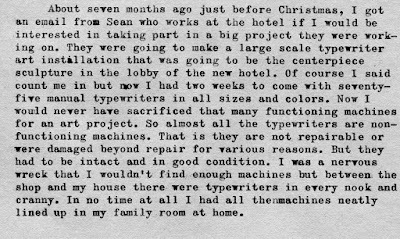 As I went downstairs for a closer look at the typewriters, I started remembering how I got each machines. Many of them have a story behind it. 75 typewriters in 2 weeks? That makes 5.3 typewriters a day. Wow it's just amazing! Typewriter is heavy it is danger to put it on the wall isn't it? I can fall any time..